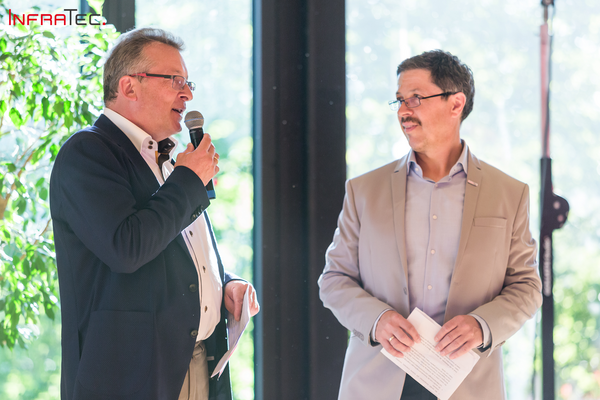 Last June, the InfraTec GmbH Infrarot und Messtechnik celebrated its 25th anniversary. A quarter of a century ago exactly to the day, the company received its entry in the Commercial Register. In keeping with the motto "entirely in the family", the 200 or so employees and their relatives were invited to a summer festival. The Managing Directors and founder members Dr. Matthias Heinze and Dr. Matthias Krauß opened the festival with a few shared words and thanked the employees for their commitment since the founding of the company. This is one of the secrets of success that we can rediscover in our own products. After the speech, both managing directors each received a group photo of all the employees - corresponding with InfraTec's business field of infrared technology as a high resolution thermal image. Afterwards, at the "Bellevue" Hotel in Dresden, the guests were offered a varied program with many surprises for young and old alike. The highlight of the evening included a laser show as well as a firework display over the River Elbe. Live music and a sumptuous buffet provided for a good mood among the guests during the whole time.